Here’s another quick manhole cover. This one is in Zama city, Kanagawa. 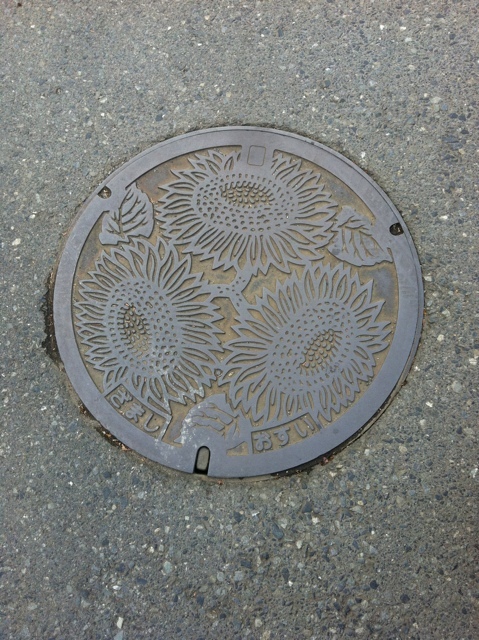 The city flower is the sunflower. I haven’t seen any, but I’ve heard Zama’s famous for sunflower fields. Another interesting thing is that sunflowers aren’t normally grown in Japan for their seeds. In Canada, we use sunflower seeds as a snack, and also use it to make sunflower oil. They’re also useful for removing radiation from soil, which I find quite interesting. Zama city has a sunflower festival in summer, which I’d like to see. Anyway, here’s the sewer manhole cover.